The apocalyptic visions of climate change that are projected in the media often involve extreme weather events, disasters and mass migration of poor people. This book takes a critical look at this notion, drawing on research in Bangladesh, a country located at the heart of debates on climate change and migration. This book argues that rather than leading to dramatic events, climatic and environmental impacts often cause incremental changes in people’s habitats and livelihoods, making them migrate in search of better places and income. With or without climate change, climatic and environmental factors can impoverish people, and drive displacement and migration, especially in the global South. These influences, including disasters, need not necessarily make people move, but instead sometimes trap the poorest and the most vulnerable people in their places exposed to hazards or make them migrate to even riskier places, such as crowded and flood-prone urban slums. This book argues that restrictions placed on people’s mobility options could increase their vulnerability and favours proactive migration policies. 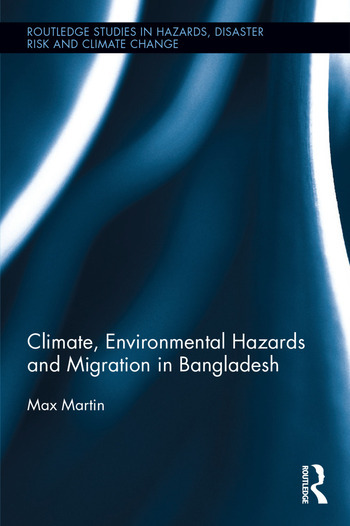 This timely contribution explains the climate-hazard-migration nexus in an accessible, engaging language for students of geography, development studies, politics and environmental studies, as well as humanitarian and development practitioners and policymakers. Max Martin is a geographer focusing on people’s responses to climate and environment. He studied at Universities of Kerala, Oxford and Sussex. He has engaged in research at the Institute of Development Studies, UK, and International Centre for Climate Change and Development, Bangladesh; and taught human ecology at University College London. Currently he is a research associate at Sussex, developing a marine weather forecast system called Radio Monsoon for artisanal fishers of the Arabian Sea.